worked. Try approving of yourself and see what happens. chance to recognize and honor who they truly are. We can't fully be ourselves without first acknowledging our self-worth and getting to a place where we can be at peace with who we truly are. Honoring our self-worth is one of the first steps to recognizing our true potentials. When we don't recognize our true potentials, it also becomes difficult for others to recognize them. This in turn can dictate the way we feel about ourselves and the choices we make. In order to truly recognize our true potentials and live from a place of authenticity, we must release our attachment to the opinions of others. This doesn't mean that we should ignore or disregard other people's opinions altogether. This simply means that we need to cultivate self-compassion in order to help us navigate through the myriad of ideas and opinions we encounter every day. From there, we can begin to listen to what others have to say and figure out which opinion comes from love and which comes from fear. Stepping away from people and situations that constantly belittle us is a choice, and it is one of the most important steps we can take to recognize our self-worth. When we feel that we aren't worth the job, relationship, or whatever positive outcomes we create, the way we feel can be seen in what shows up in our lives. Rather than feeling guilty about the way we feel, begin to respect ourselves enough to walk away from people or situations that no longer serve our greatest good. If we refuse to let a person or a situation to negatively impact us, we can start to shift our energy and what we allow into our lives. By acknowledging to ourselves that we are all on our own unique journeys and that there is no spiritual race, we can start feeling more at peace with the pace of growth in ourselves and in others. that no longer serve our greatest good. Happy New Moon! The Moon is conjoining the Sun in Aquarius, marking a rebellious and revolutionary New Moon in the sign of the Water-Bearer. Seeing ourselves in a new light can be highlighted now as we explore more deeply what it means to stick to our guns. Our inner world is more colourful and we can feel more energized with work that helps us express our inner artist. The Aquarius New Moon brings to us the reminder that in essence, we are free to do what we choose. That we are not victims of outside circumstances and that we do have choices in everything we do. It is all a matter of perspective and breaking out of old mindsets. With the Moon forming a sextile to Uranus and Saturn, the insight of self-responsibility empowers us to envision a brighter today and tomorrow. We have the right to change our lives. To trust our feelings to guide us toward activities that are more meaningful and fulfilling. To not wait for another's permission to take charge of our destiny. Continue trusting our heart's guidance as our career evolves and changes. Everything we have experienced has brought us to this moment. Are we going to keep playing it safe? Or are we ready to shatter old paradigms and take new steps in the direction of our dreams? envision a brighter today and tomorrow. The Moon is also forming a trine to Jupiter, and we have come to a point where going it alone is no longer optimal for us. As we raise our standards and self-esteem, we can attract more like-minded, sincere and helpful people into our lives. Imagine for a moment how our lives would be if we felt more comfortable asking for and receiving help from others. The universe has a way of presenting us with the perfect people to align with who can help us evolve during the next phase of our journey. The New Moon in Aquarius is a time of embracing interdependence, allowing teamwork and independence to merge, making room for miracles to happen. plays a core role in helping us to understand emotions in others. Sometimes the truth behind our emotions is more than we can handle. Sometimes we try to ignore that truth in the hope of getting on with our lives. There are times when we can see the reason behind our emotions easily. And there are also times when we can't recognize the reason because the truth lies deeper than we care to see. Being afraid of our emotions won't help us to understand them better. 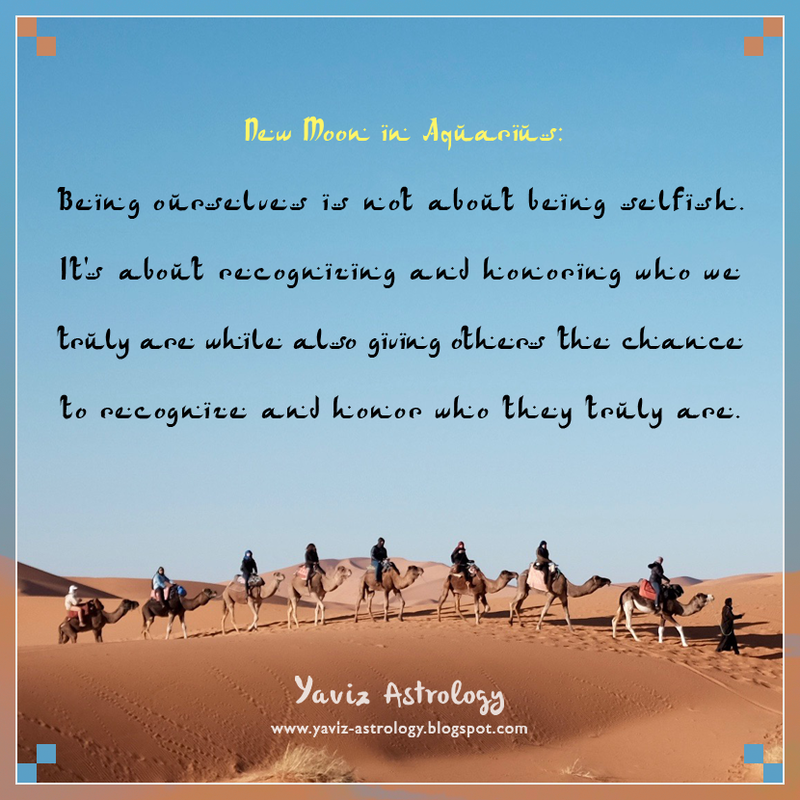 Recognizing them for what they truly are can encourage us to feel more empathy toward ourselves and therefore helps us to understand ourselves better in the process. Feeling empathy toward ourselves is not the same as pitying ourselves. Self-pity comes from a place of self-condemnation, whereas self-empathy comes from a place of self-love. Being empathetic with ourselves directly impacts how we relate to the world and interact with others. We can develop this empathy through mindfulness and self-awareness. By opening ourselves to truly feel and experience everything that is going on within us, we will learn to appreciate our humanity. Negative emotions such as anger or jealousy may be uncomfortable to experience, and we may at first feel resistance to the idea of acknowledging them. The first step to overcoming this resistance is by realizing that to feel emotions is to be human. To understand that it is natural to have emotions, so long as we don't stay in negative or low energy emotions for too long. Low energy emotions include emotions such as shame, sadness, worry and anger. And high energy emotions include happiness, gratitude, compassion and love. By recognizing that each and every one of us has emotions, we will become more aware of our own feelings. From there, we can become better at understanding our own psychological state and deepen our sense of compassion toward ourselves and others. self-empathy comes from a place of self-love. Happy Full Moon! The Moon is in Cancer and forming an opposition to Pluto and the Sun in Capricorn, marking a Full Moon in the sign of the Crab. Everything that we have experienced has made us who we are today. All the suffering and sorrowful moments have been our teacher. We have gotten this far, and one of the reasons why we don't need to worry about the future is because our new sensitivity can help us to separate the truth from the lie. Pay attention to personal revelations and insights when we recognize a truth that is meaningful to us, as they can open a doorway to new courses of action. Ask ourselves what we would like to change and what steps we need to take next. Our dream of putting our life lessons into practice begins now as we reaffirm our intention to inspire others and make a difference. There's a message to remind us that we are indeed more powerful than we believe ourselves to be and that we need to embrace the change we are going through with unshakable faith. Begin to see change not as something to be fearful about, but more as a learning opportunity to go to the next level of evolution and growth. Imagine how different will our lives be if we released our fear of change and replaced it with surrender to our true, higher selves? inspire others and make a difference. The Cancer Moon is forming a trine to Venus, Neptune and Mars, and we are tapped into divinely inspired ideas. Our imagination needs nurturing, and playfulness can help express our inner artist. This aspect is also about purifying and detoxing, which means reducing negativity by spending time alone in prayer or meditation. Any form of negativity that we can release now can disentangle us from anything that no longer serves us and break patterns that are holding us back from moving forward. We may wonder if we are on the right path, or whether we are making the right choices. Rather than worrying about what needs to happen next, put our whole focus on the present moment and on listening to our heart's calling. With the Moon's square to Uranus and Jupiter, the sky is not falling. We realize that the negative narrator within is simply the voice of our small, vulnerable and fearful ego. A fresh opportunity is here for an evolution, and we can begin by rewriting our story. Challenge the negative thoughts every time they come up. Remind ourselves that although there will always be things we cannot do anything about, we can change how we think about them. 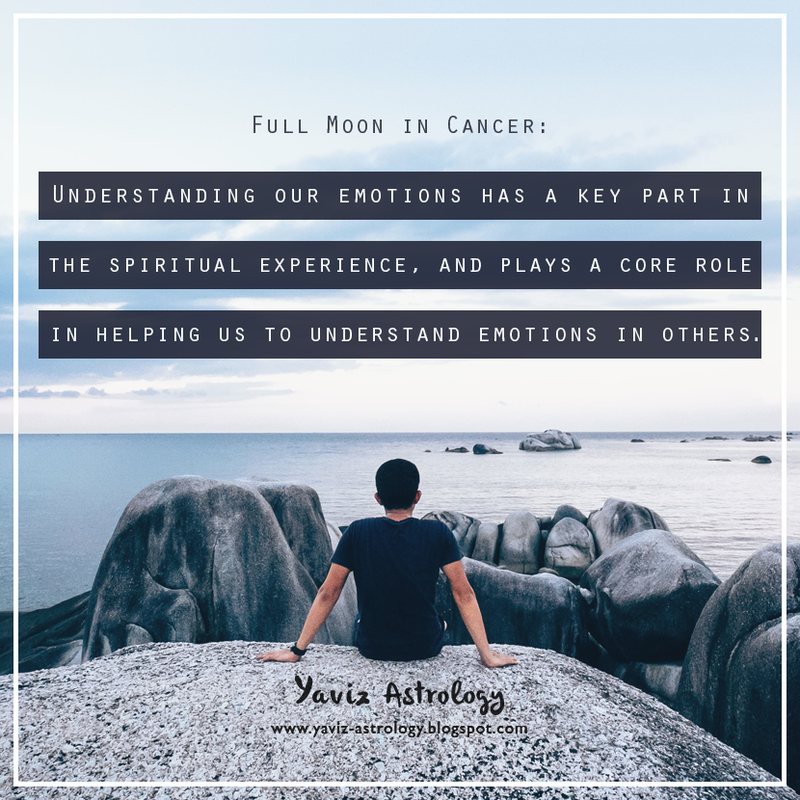 The Full Moon in Cancer is asking us to learn to love ourselves through our occasional missteps and see them as opportunities to evolve and ascend. To understand that every emotion has a function, even the so-called negative ones. To know that our feelings can become our allies, and they can guide us as we steer our lives in new directions. Do not let emotions sweep us away, instead, let them set the sails and point the way to new horizons.